From watching your favorite sports teams (Go Texans!) to binging your new favorite show on Netflix, countless hours are spent watching TV with friends and family. Media centers can attract a lot of attention, so we pride ourselves on providing the best in modern entertainment centers, storage consoles, and TV stands. Fully adorn the living room in your home with the Andalusia Entertainment Center that is rich in traditional design. Constructed of high quality walnut and cherry finishes, this unit is fashionable and functional in design. The rich beveled wood carving accents makes this fully outfitted unit a fantastic furniture choice for your home. Are looking for the perfect furnishing that has excellent durability and is great for storing your game consoles or DVRs? If so, The Mesh Entertainment Center will perfectly suit you and the style of your living room. As you sit comfortably on your sofa, allow this entertainment center to hold your entertainment items as you enjoy a movie night with family or a competitive game of your gaming system. 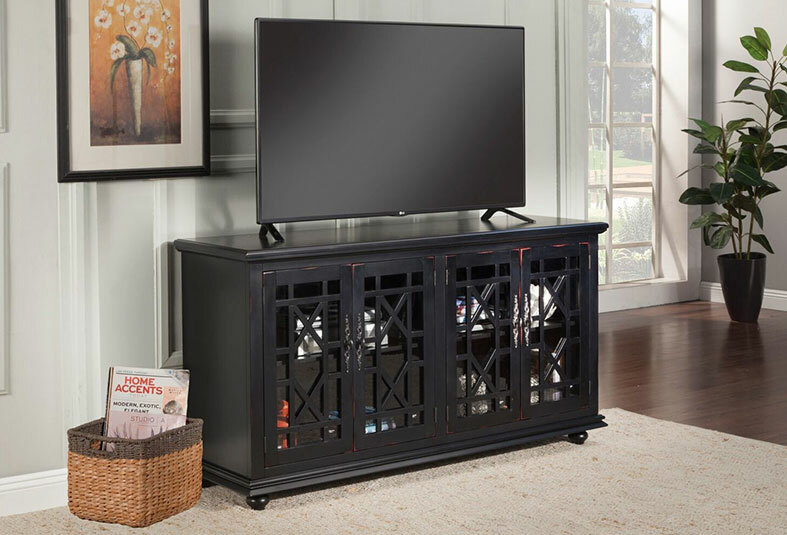 The Cassandra Entertainment Center features a beautiful Antique Black finish with sophisticated transitional styling. Elegant trellis details on the glass doors, intricately cast door pulls, turned bun feet, and architectural moldings are all blended together for an exquisite look. This beautiful and expansive entertainment wall unit is sure to make a grand statement in your living area. The setup's standout feature is the set of expertly crafted and contemporary styled sliding barn doors, which boast tall vertical handles and concentric grooved rectangles. The Platinum Entertainment center impresses with its tall, sweeping, Tuscan brown finished, curved wood legs. Black, tempered glass shelves and black steel and chrome accents finish the modern look. Built to accommodate today’s larger flat panel TVs, the console is constructed of heavy duty steel with gloss black powder coated finish. For added style, chrome trim accents each leg. Large, black tempered glass shelves provide ample storage and display options. The rear leg support includes access openings for routing cables for an uncluttered set up. Distressed with an air of industrial history, this Cannon Valley is a beautiful tribute to the past while maintaining a distinctly contemporary feel. Clean lines, and ample storage make this media unit a wonderful add to any home. Crafted and constructed from Acacia and veneers, the Martini Wall Unit has the ability the integrate clean, modern styles. Through a bold black coat and silver accents, this wall unit exudes perfect balance at every angle. Distressed with an air of industrial history, this Cannon Valley is a beautiful tribute to the past while maintaining a distinctly contemporary feel. Clean lines, and ample storage make this piece a wonderful add to any home.